The Boundless CF 710 is a portable unit that is strictly for concentrates and is the first wax pen release for Boundless. They seem to have somewhat of a Midas touch in the way that I have yet to be disappointed by one of their products. This unit in particular, is pretty much an electric nectar collector. It is designed to look like a big vape pen that resembles a highlighter or large marker, with a removable cap at the bottom that unscrews to reveal the ceramic or quartz coil, that heats up instantly after pressing power button. 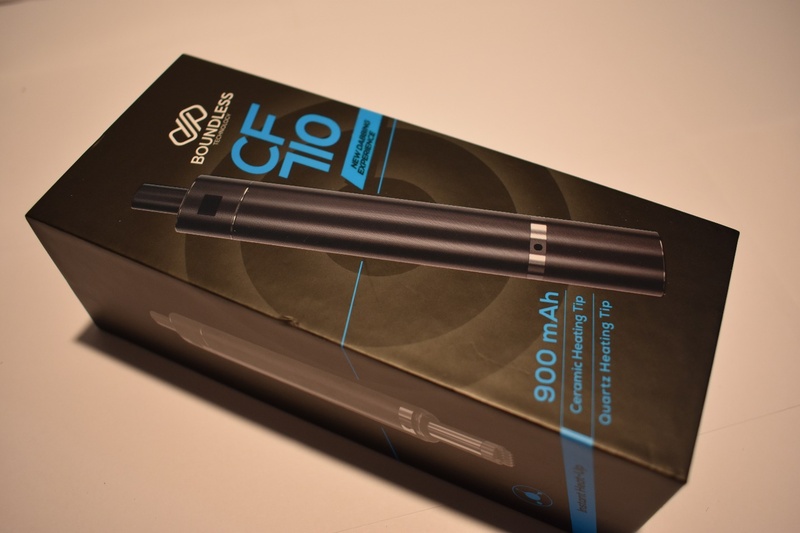 Designed like the Nectar Collector the CF 710 however is way more efficient being battery powered. No need for torches is advertised on the side of the box hinting to the fact that they have a better or just as efficient product as the nectar collector but will save you time and money. It’s pretty much a giant dab straw that looks like a jumbo permanent marker with the mouthpiece up top and you unscrew the cap at the bottom to reveal the coil. The coil is interchangeable, they unscrew from the unit once exposed and it also comes with a Ceramic Rod Dabbing Coil as well as a Quartz Rod Dabbing Coil to use depending on preference. As for the battery life on the CF 710 I was fairly impressed myself the unit lasted around 37 to 40 hits before it died completely. The CF 710’s Battery indicator is ran on a light system green for full, blue for low and red for about to die. It ran for about 28 to 30 hits before the light turned blue and was good for another 7 to 10 hits after that. The charge time is fast as well, it took around 2 to 2.5 hours from dead to completely full charge. 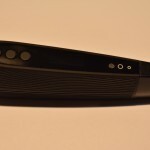 Boundless is very user friendly with their products and most are self-explanatory. The CF 710 doesn’t fall short from that it is also very easy to use. Choose the coil of your choice (Quartz or Ceramic) then unscrew the cap located at the bottom of the unit to reveal where to screw the coil in and screw the coil in to the unit gently until it’s snug. Once you have set it all up, place your Concentrate in the glass container provided or any glass bowl or surface. Power the unit on by pressing the button located at the top by the mouth piece 5 times fast. You will see a green light opposite the button blink once powered on and to insure you have powered it on and not off press the power button again the green light will indicate the coil is heating. Hold the power button for 2 seconds and then place the coil to the edge of your concentrate, while continuing to hold the power button pull from the mouthpiece of the vaporizer like a straw and graze the concentrate for about 7 to 10 seconds per hit. The unit has a burn off option for cleaning the coil by pressing the power button 3 times while on, it will heat the coil for a continuous 15 seconds. You can also use this option for hands free big rips of your concentrate. All in all, the Boundless CF 710 is a great product at its low price range of around $120 you get banged up for your buck. With it’s fast heat up time, sleek easy to use design, long battery life, and fast charge time, it’s a very efficient wax pen. My only negative opinion about the CF 710 would be that it burns up product really fast. Other than that, I believe Boundless has done it again with another GREAT product that I would recommend to anyone who has $120 bucks at their disposal and was in the market of buying a wax pen or dabbing device.